Highly concentrated oxygen compound that reduces and eliminates combined chlorine levels in pools and spas. Use as a non-chlorine shock for pools, spas, hot tubs, ornamental ponds and fountains. Excellent OXIDISER for Ionised and Nature 2 Pools and Spas. Used regularly - potentiates sanitiser effect. pH neutral - compare to similar products. Contains clarifying agent for sparkling clear water. Lo-Chlor Aqua-Boost is not a sanitiser and does not replace chlorine or bromine. 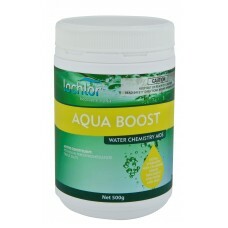 Lo-Chlor Aqua-Boost can also be used in ornamental ponds and fountains. Unlike other non-chlorine shocks (which lower pH), Lo-Chlor Aqua-Boost does NOT affect the pH of Pool Water. Users should take care when using this product. Please read safety directions before use. • Because Lo-Chlor Aqua-Boost has the ability to oxidise protein and other organic material it is an invaluable aid in pool and spa treatment, where shocking is required. • A regular dose will benefit all pools and spas (we recommend this be done at least monthly). It is particularly useful in salt chlorinated pools and Ionised pools. Bathers can enter the pool 15 minutes after application.